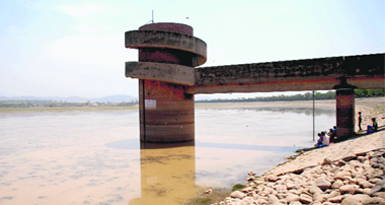 In a major setback to the efforts of the UT Administration to save the city’s landmark Sukhna Lake, the committee constituted by the Punjab and Haryana High Court to save the lake has rejected the proposal of the Administration to bring water from the Kajauli waterworks to the lake, particularly during winter, to tide over the water crisis. The construction of the much-awaited project for eight underpass of the UT Administration is expected to take off soon as it has received Rs 5 crore for the project from the Union Government. The Administration has already designated Chandigarh Housing Board (CHB) as the nodal agency for the construction of the underpasses to tackle traffic chaos on city roads. Inviting criticism from several quarters, the Indian Certificate of Secondary Education (ICSE), will now do away with its compulsory environment education examination. Strange, but it is a fact that employees of the Municipal Corporation (MC) who are in the “good books” of their seniors can only get commendation awards on Republic Day and Independence Day as the authorities have no eligibility criteria to go about it. 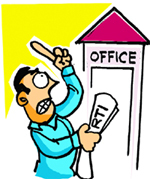 The reply of the MC authorities was “nil” on an RTI query regarding the yardstick or criteria adopted for the selection of employee for the awards. A Ludhiana-based doctor, Sumit Sofat, who was accused of framing another Ludhiana based Pashan family in a criminal case, did not file any reply on the local police’s argument that his driver had never received any gunshot and the bullet was planted inside the body. A high drama witnessed at the General Hospital, Sector 6, today, over the possession of the dead body of a 75-year-old woman as her brother in-law suspected a foul play in her death and demanded the post mortem of the deceased. The Union government has given a bonanza to the Chandigarh municipal corporation by allocating around Rs 15 crore more than the proposed budget by the UT Administration for various developmental projects for the next fiscal year. For the next fiscal year, Rs 171.60 crore has been approved in the Budget as against the proposed Budget of Rs 156. 60 crore, submitted by the UT Administration. Over 3,500 jewellers across the tricity today went on a three-day strike to protest against the imposition of excise duty on the purchase of gold. “We have closed our market for three days as all gold shops in the country will remain closed. 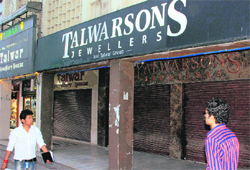 All jewellers in the country will keep their shops closed for three days. Residents can heave a sigh of relief as the Water Supply and Sanitation Wing is not likely to go in for water rationing this summer in Mohali. Continuing with its drive against the shopkeepers, who have covered the corridors of upper floors in Sector 17, the estate office today issued more notices. In the past three months, around 70 shopkeepers have been issued notices. In the last three months, around 70 shopkeepers have been issued notices. 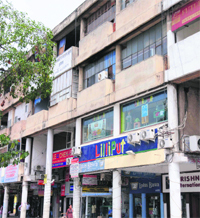 To maintain the heritage status of Sector 17, the UT Administration has directed the estate office to issue notices to shopkeepers asking them to remove illegal constructions. Zirakpur, March 17 The newly elected MLA Dera Bassi Narinder Kumar Sharma yesterday resigned from the post of Zirakpur municipal council president and Ward No. 6 councillor. He submitted papers to the Zirakpur Executive Officer. MC vice-president Kulwinder Sohi will now officiate as the MC president. NK Sharma stated that the election to the post of president would be held later. Sohi will work as the officiating president. 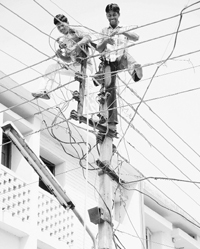 Workers work on an electricity pole at Sector 20 in Chandigarh on Saturday. A team of the CBI today conducted a raid at the house of superintendent with the Central Board of Excise and Customs BP Singh in Sector 38 and recovered 50 bottles of Indian Made Foreign Liquor (IMFL) and Rs 8 lakh in cash. A blood donation camp was organised at Punjabi University Regional Centre of Information Technology and Management here today. A total of 46 units of blood were collected at the camp. Dr Upasna Joshi, head of the department said that the camp was organised in the memory of late Setul Verma, an assistant professor in the department of computer science. A 35-year-old man was electrocuted while working in his field Mattawala village at Morni block district, here today. CBSE class XII accountancy exam held this Thursday has left thousands of city students complaining. Going by the reports filed by centre superintendents and principals of various schools, students found the paper to be exceptionally lengthy, ambiguous and beyond the level of comprehension. A delegation of associate professors working with the Government Colleges in Chandigarh met UT Adviser KK Sharma on Friday and submitted a representation demanding that as per the orders of Punjab and Haryana High Court, the charge of officiating principal should only be given according to the recruitment rules notified on April 3, 2010. The rules state that the senior most teacher, possessing a PhD degree, should be appointed as principal. University Business School, Panjab University, is going to hold a national seminar on ‘Global Supply Chain Management: Challenges and Prospects’. Focusing on the supply chain management innovation and practices, the event will offer an opportunity to academicians and industry leaders to discuss supply chain management in the global context. Making the city proud, Prabhjot Singh, a student of Punjab Engineering College, stood second in the country in Graduate Aptitude Test in Engineering (GATE) under the mechanical stream. Over 1.12 lakh students had appeared for GATE under this stream. 22-year-old Prabhjot, a resident of Kurukshetra hostel of PEC, hailing from the Sangrur district of Punjab, scored 91.33 marks out of 100. Little cherubs of Euro Kids school presented their annual show today in the presence of cheering audiences comprising of parents and children. The annual day was celebrated by all the branches of the school, including the branches at Sector 18 and 37 in Chandigarh, and Panchkula. The Punjab Governor, Shivraj V Patil, exhorted the students, faculty members and professors to embark on a goal-oriented research and teaching, which would enable the Punjabi youth to take up the challenges of the state leading to national development. It was a day of remembering the legacy of Major Jiwan Tewari, a doyen of distance education. To mark the occasion, a lecture was organised by the University School of Open Learning (USOL) - the brainchild of Major Tewari - which opened to the public in the year 1972. The event began with a documentary showcasing the life of the true philanthropist. Ram Leela committee, Dera Bassi, organised a free medical check-up camp in Ramleela ground, here today. Over 1,000 patients were examined free. Along with that eye operations were also conducted during the camp. A team of doctors from a Dera Bassi hospital visited the camp and checked the patients. The team of doctors included Dr DS Verma, Dr SS walia, Dr PC Goyal, Dr RS Rana, Dr PC Singla, Dr Gaurv Goyal, Dr Brijesh Sharma. ICT-2012, a national conference on the “Role of Information and Communication Technology (ICT) in Societal Applications and Industrial Applications” concluded in the campus of host college Sri Sukhmani Institute of Engineering & Technology, Dera bassi, on Friday with a valedictory and certificate awarding ceremony. A newly married young woman allegedly committed suicide at the residence of her in-laws. The deceased has been identified as Gurjeet Kaur, 22, wife of Gurpreet Singh belonging to Badla village, Baddi Pathana. The mother of the deceased, Jaswant Kaur lodged an FIR with the Bassi Pathana police in this regard. She also alleged that the in-laws of her daughter used to harass her unnecessarily. She also alleged that when she reached her in-laws, there was no one at their house and her daughter’s body was lying. A two-day national symposium on “Education and Research in Forensic Science: Issues and Challenges”, organised by the department of forensic science, Punjabi University, Patiala, concluded here. The symposium provided a forum for deliberation on issues relating to forensic education and research. The team of the town-planning department accompanied with officials of the district administration had to return empty handed yesterday as they failed to demolish more than 58 illegal structures in Anchal Vihar colony near Lohgarh village of Pinjore. Justice RK Garg of the Punjab and Haryana High Court visited the district court complex on an annual inspection, here today. According to the information, Justice Garg also inspected the functioning of the courts besides checking the annual records and the staff in the court complex. The police arrested a 35-year-old drug peddler, Sunil, a resident of Sector 25, and recovered 140 injections of buprenorphine ABL-10ml from his possession on Friday night. The recovered injections were to be supplied to drug addicts. The CIA staff, today, nabbed a dreaded criminal, Gurbhej Singh, who had helped his accomplice Amit Kamboj in escaping from the clutches of the police last month. The local police has arrested the second accused from the bus stand at Phagwara in Punjab, today, who was involved in a broad day robbery at a city based realtor in Sector 7, two days ago. The local police has arrested one of the remaining accused in the car theft cases registered in the town. The police today arrested Satnam, a resident of Behlana, who tried to break open an ATM on March 6 near MES headquarters, Airport light point. In a keenly contested match, Daksh defeated Udgam in boys U-12 category during the opening round of LD Kapoor Memorial YMCA Total Tennis Tournament being held at the YMCA Total Tennis Academy in Sector 10 here today. The Punjab Cricket Association (PCA) will open six special coaching centres for players in the 13 to 15 age group. An all-round performance by Vijay Bhasin (80 runs and 3 for 17) enabled BTS to defeat AG Haryana Cricket Club in the third match of Saupin’s 32 Veteran Cricket Tournament (above 50) held today. Kedar Jadhav enabled West Zone to defeat East Zone by 108 runs in the first semifinals of the Prof DB Deodhar Trophy being held at the PCA Cricket Stadium here today.